Hmm... how interesting. Konda is indestructible, so the +5/+5 bonus is more than enough. Konda's trouble is his casting cost. Games are often over before turn 7, and/or lots of other things are going on by then. So this will probably fit a nice casual niche, where getting set up is a little more leisurely, and eye-popping features are more acceptable. In limited, Konda should be played. Things that are highly costed are often (but not always) game turners in a stand off. This guy would definitely qualify. If you end up in a game where you're just staring at each other, Konda hits the board and changes things pretty quickly. What doesn't this guy have that would make him perfect? (Well, trample, but we'll make do.) He's indestructible (darn it, I wish that mechanic was left in Darksteel, never to be seen again. Oh well...). He has Vigilance (finally they keyword that). And he has "Don't fight me or I will smash you." The +5/+5 just puts this guy over the top. And yet, since he costs 7 mana, I don't see him coming into play for constructed at all. He'll do quite well in casual, and people will love to rip this guy in a draft, but 7 mana is too much for a 3/3 in constructed. 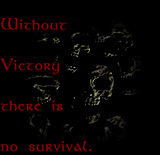 No matter what the abilities. Eight mana for a 3/3 indestructible guy?! That’s more than Darksteel Gargoyle, who at least doesn’t have a colored mana requirement, can’t be Terror-ed, and has flying! The big benefit of this guy is Vigilance, but I’m unsure if that makes it worthwhile or not, even with the Bushido, which makes it an 8/8 wall that attacks for three a turn. This one is hard to call, and how good he is will depend entirely on how slow the new format will be. * game store owner (The Game Closet - Waco,TX) Hrm. I don't know what to think of this guy. He almost seems like a finisher type creature for slower control type decks. He's a bit expensive to cast. He's only a base of 3/3. But on the upside, he's hard to block AND he's indestructible. Interesting to see that on a non-artifact creature. In most formats I'd pass on this guy as you can probably find some better cards to play over Konda. This card just doesn't seem that good. Yes, he can attack without tapping. 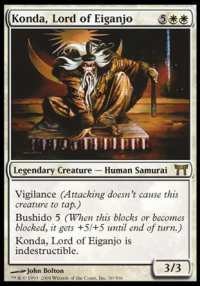 Yes, he has Bushido 5 (meaning he's +5/+5 whenever blocking or blocked). Yes, he is indestructable. But none of this seems to counteract the fact that he costs seven mana. I really can't name the last time that I played any creature that costs 7 and doesn't have some form of evasion (see: Eternal Dragon). The fact that an opponent can chump-block Konda all day just brings him down further in my eyes. I won't call Konda completely awful, but I also refuse to call him a good card. Konda might see a bit more play in casual environments, if only because he is a Legendary Creature and he can be massive. Casual games also tend to go longer than Constructed games, meaning you will more often get to seven mana. In limited, I'll scoop Konda fairly early, if only because he can be a fatty and he's hard to get rid of. Check the pack first to see that there isn't a solid removal pick or just a better, cost-efficiant creature, and if not, go for Konda. defense simultaneously. He can win games... though still, 7 mana is a lot. One word: bad. He comes out on turn 7, puts your opponent on a 7 turn clock and lets you block basically everything. Not to mention he can be countered. He’s not really a stall card, and he can’t win you the game. And about the Bushido thing, I don’t really care for it either. Anything with Bushido on it is going to have to cost more than it would, and it will probably cost to much to make a difference. Then again, 8/8 indestructible blocker is not bad.